Today I want to write about a problem that’s encountered by many smartphone users: data recovery. You might have faced the need to recover an image or a video that was deleted in the past, I know I did. In most cases, I had to recover data from a memory card. There are many ways to recover a file that was previously deleted. The Internet is packed with all kind of “how to” videos, apps and tutorials and you might get lost with all the alternatives that are available. I have tried many of these apps and I have concluded that some work for Windows OS, some will work only on Linux or OSx/macOS. But in most cases, getting around these apps is difficult and most of the time you will not get the expected results. In the end, I have managed to find a software that does the job properly, allowing me to fix a problem that was burning heavily on my mind. The problem: deleting the pictures and videos, no backup available. Every few months, I move all the images and pictures from my smartphone’s memory card to my external hard drive. Two weeks ago, I noticed nothing in particular about the process, the files were copied without any problems. So, of course, when the task was completed, I have released the memory on the micro SD card by deleting all the media content that was previously copied. One week later, I decided to view all those backed-up images and videos on my living room TV by connecting the external HDD to TV’s USB port. You can understand my frustration when I learned that only 20% of the content was available for play/view. The other 80% was there, but it was corrupted (each file had 0 kb size). The first thing that flooded my mind was pure panic, since those images and videos were really important to me. Than, I remember about EaseUS. It got me out of trouble in the past when I had a similar problem with a corrupted SD card. First things first. 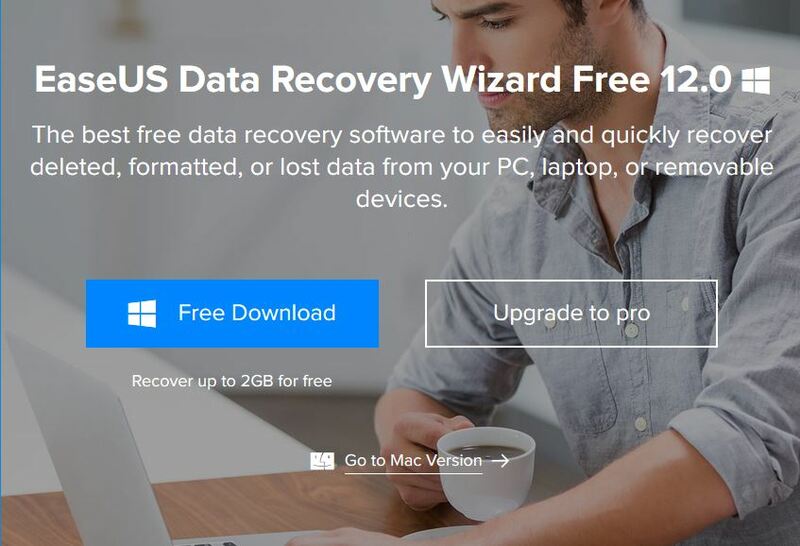 There is a free version for this recovery software that allows you to recover up to 500 MB of deleted content or up to 2GB if you will share it with your friends. If your deleted content is larger, you will have to perform an upgrade to a paid version. Now, let’s see how it works. The dashboard is pretty straightforward. You will have to choose to location where the app will scan for deleted files. You can select an entire partition or a particular folder on your local disc. Once you press the Scan button, the process starts. Depending on what you are scanning, it could take up to 30 minutes or more. In my case, scanning an entire 32GB micro SD card took around an hour. Once the process is completed, you will notice that there are multiple results listed. You can use the filters in the left column and filter only a particular type of file. Alternatively, you can browse the entire folder/partition and see all the results. Once you have decided what you need to recover, just select the files and press the Recover button. The application will ask for a location on the local disk where the recovered files will be saved and … that’s pretty much it! No hassle, no complicated process, no need to install additional apps. Depending on the situation, some files may be listed with different names (usually generated by the software). Don’t worry, there is a preview function that allows you to see/watch the content and decide what to recover. If you are not sure at the moment, you can save the session in a file and continue the recovery process later. 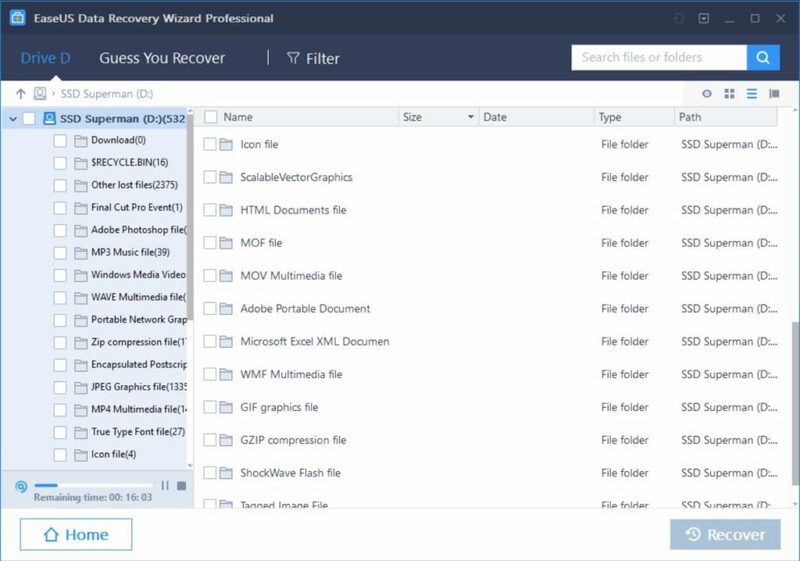 If you need to recover files that were deleted by using the “Empty recycle bin” functions, you can use EaseUS’s recycle bin recovery solution that’s pretty similar in design to the app I have introduced above. 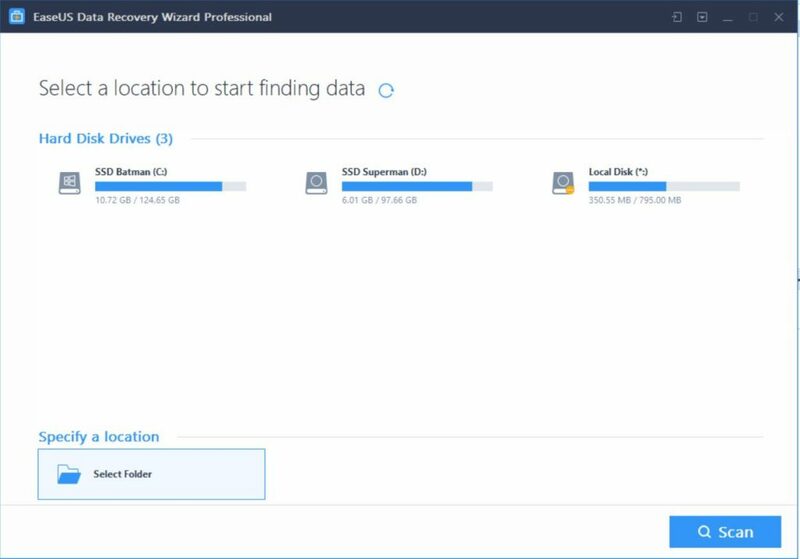 EaseUS Data Recovery Wizard 12 works like a charm in most cases except one: when other files are created on the same disk space. Let me be more explicit. When a computer or a smartphone deletes a file, it is not actually completely removed. It is just removing the reference to the file on the disc/microSD. When that header/reference is removed, the system will no longer see the file, which means that its storage space is no longer reserved and it can be used to store other files. In my particular case, between the time I have deleted the pics and videos and the time I have decided to recover them, I have used the smartphone to shoot new pictures. Some of these pictures were copied over the storage space of the ones that were previously deleted. In this particular scenario, the old content cannot be recover properly or cannot be recover at all. By using the same app, you will be able to recover files from a corrupted memory card. I had encountered this problem last year, when a faulty microSD to SD adapter corrupted my card. All I had to do is select the card in the dashboard, press Scan and wait for the app to find all the content that was stored on the card. Simple as that. Also, there is a Mac version of the app that allows you to perform the same functions.